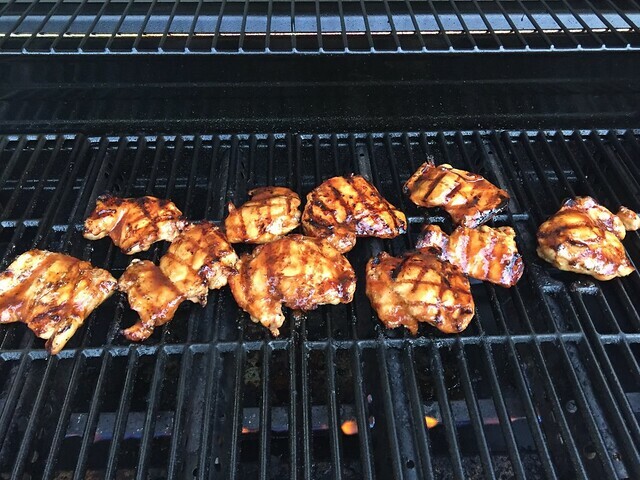 Hawaiian Glazed Chicken is sort of a happy new recipe accident. 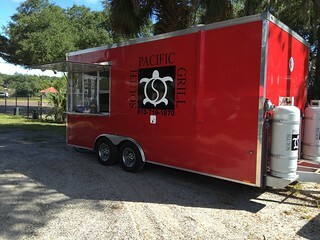 My favorite restaurant near my house is actually a food truck called the The South Pacific Grill (greater Tampa/Brandon area) that serves amazing Hawaiian/Asian influenced food. Their Huli Huli Chicken is TO DIE FOR and since I can’t always get out to their truck for a fix, I thought I’d try to recreate it at home. Well, after scouring the google, combining a lot of ideas, and a couple of experiments, I’m still not very close to making proper Huli Huli Chicken but this last attempt was so good, I figured it deserved to be a featured recipe all on its own. The chicken cooks quickly so it stays super tender and moist and the sauce has quite a nice tang. I made this on the grill but you could also use a grill pan indoors or even a broiler. For best flavor, this needs to marinate for several hours – at least 2…4 or 6 is even better, so plan ahead! Basically the marinade is everything you see up there minus the chicken. 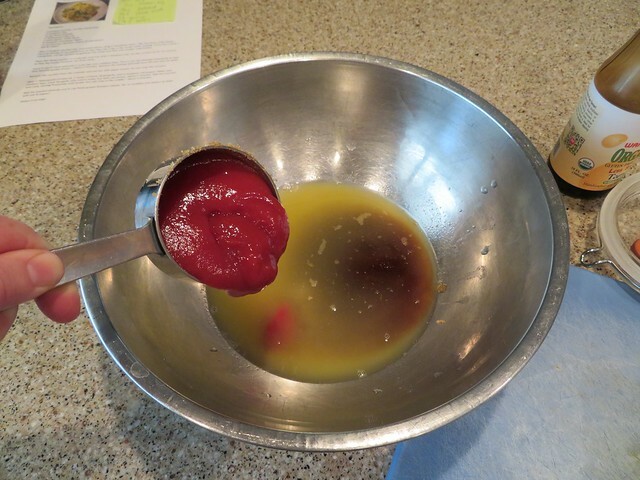 In a big bowl combine 6 ounces of pineapple juice with ½ cup brown sugar and ½ cup ketchup. 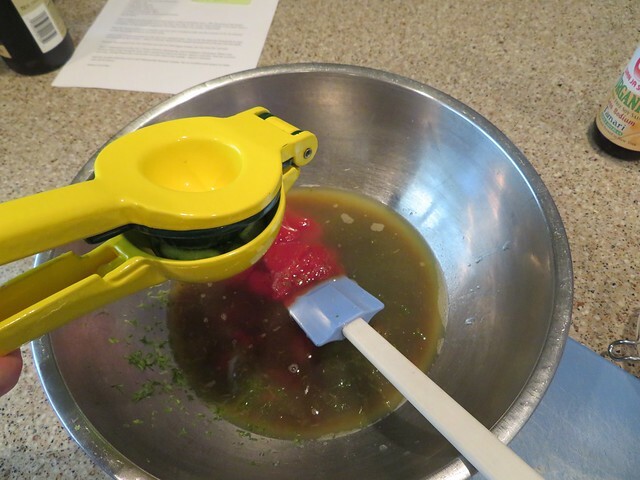 Grate the zest off of the lime and add it to the bowl then squeeze in the lime’s juice. Add 1/3 cup of soy sauce or tamari if you are gluten free. Grab a microplane or small grater and grate up a 2 inch piece of peeled fresh ginger, about 2-3 teaspoons. While you have the microplane handy, grate up 2-3 big garlic cloves and add them to the bowl. 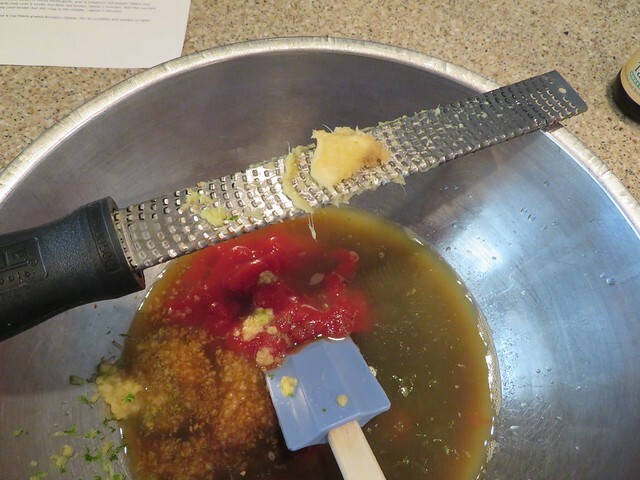 Whisk or stir to combine and to dissolve the brown sugar then pour ¾ cup of the marinade into a small bowl or measuring cup and set it aside. This is your glaze for the chicken as it cooks. Because this is SO good and SO easy, I like to make a lot of chicken. 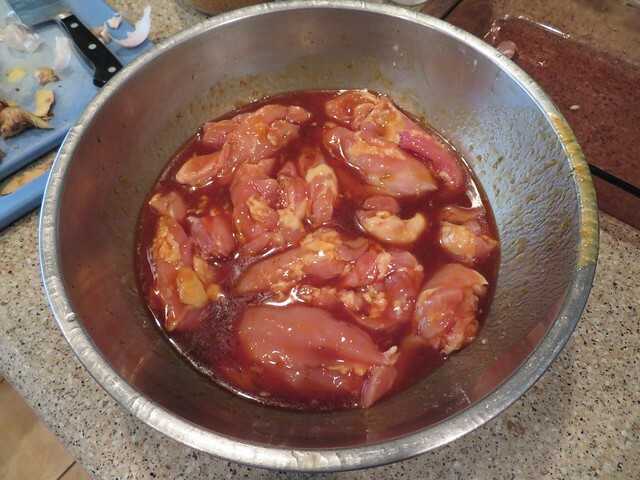 It makes great leftovers too so I have 10 boneless, skinless chicken thighs, about 3½ – 4 pounds total. I figure each person will eat at least 2 pieces of chicken so this serves 4 or 5 people. 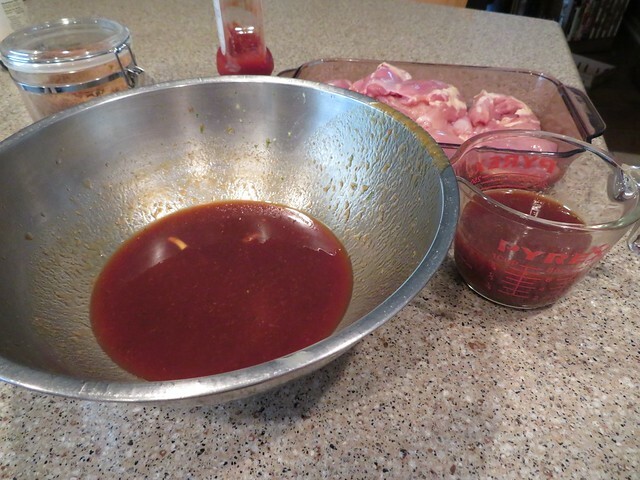 Trim any big globs of fat off the chicken and place it in the bowl of remaining marinade. Give it a good stir so that all of the chicken is coated then cover the bowl with plastic wrap and refrigerate for 2-6 hours. 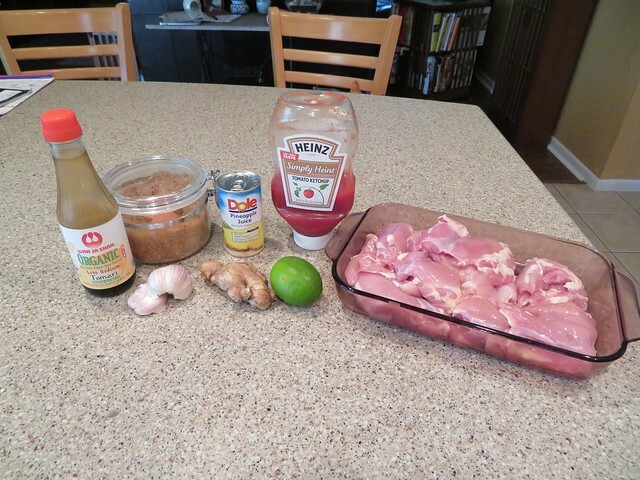 You can marinate this even longer but because of the acidity in the pineapple and lime I would NOT marinate it overnight or the citrus will actually start to cook and break down the chicken. 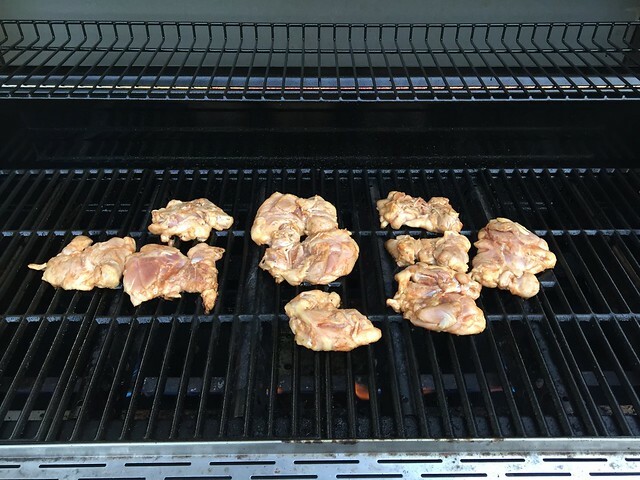 Also, I’m using chicken thighs but if you are a white meat only person (hello, lovely sister!) you can substitute boneless, skinless chicken breasts. However, I would split them and pound them flat like we do for Sesame Ginger Lime Chicken to keep them from drying out. 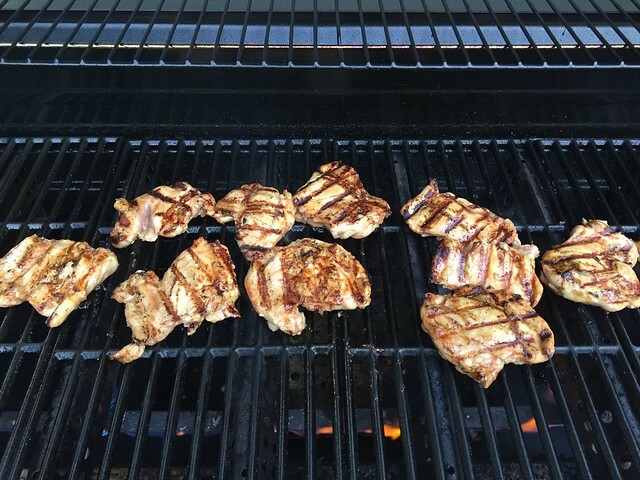 Discard all of the marinade that had raw chicken in it…that’s why we have our reserved ¾ cup for the grilling glaze. Preheat a grill to medium high and oil or spray the grates. 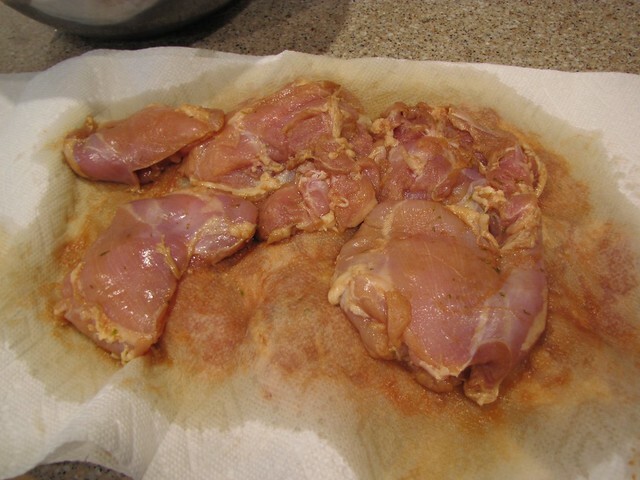 Add the chicken and cook quickly on the first side at a medium high temp – only about 2-3 minutes. Speaking of grills…how about this? Sometimes the name of this website is more appropriate than I had planned. 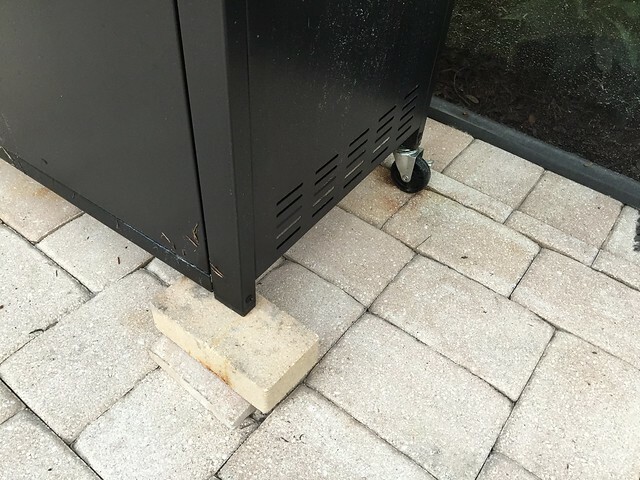 I tried to move our new ginormous grill by myself and all 4 wheels fell off! The screws for the wheels all stripped so now we have this new brick system propping up the front. Keeping it classy here at Idiot’s Kitchen. 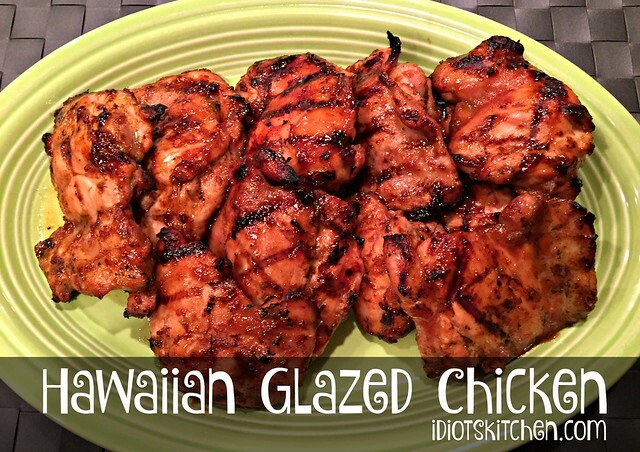 Once you have nice grill marks on the first side, turn the chicken over, turn the heat down to medium and start basting with the reserved Hawaiian glaze. The trick to this chicken is to glaze it and turn it then glaze it and turn it over and over. You want to build up a nice sticky coating of the thin glaze and also get some really good charred spots on the outside of the chicken. I turned and glazed 4 or 5 times (about every 1-2 minutes) until I ran out of glaze. Because there are no bones, the chicken only takes 10-12 minutes total to cook through. I served this with some herbed new potatoes and sautéed green beans with almonds. 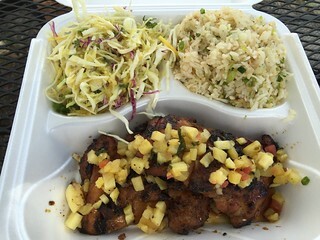 At the food truck, they make this ridiculously good coconut rice, citrus slaw (also a recipe I’d love to have) and a pineapple salsa topping for the chicken. It’s great warm or cold leftover. I often take the extra and cut it up on a salad the next day. No reason you couldn’t plop a piece or two in a tortilla either.